The exercise is created for developing speed and agility in a similar match situation. 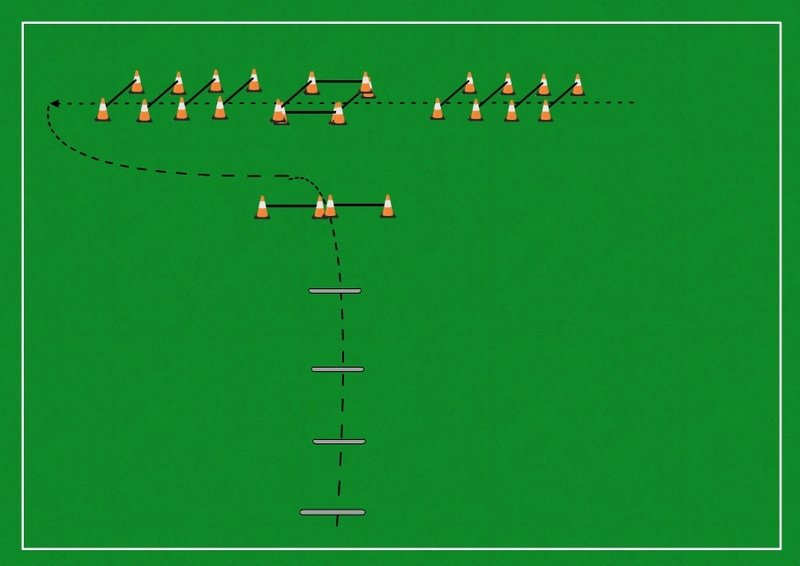 All you need to set up this drill is 10 fences with the height between 20 and 30 cm, depending of the coach plan, a square made up of 4 cones and 4 sticks and 4 or 5 sticks used in the final stage of the drill, the speeding area. 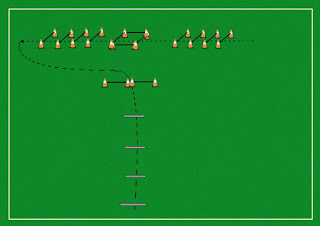 The coach or the assistant coach is setting up the drill like in the picture. The player starts from the right side at the beginning of the arrow, jumps over the small fences with both feet up high, runs to the square where he jumps forward, left, right and forward, runs and jumps over the small fences, turns around and not speeding down, jumps over the fence and sprints with jumped steps. The distance between fences should be around 50 cm, the distance between fences and square should be around 3 m, and the distance between jumping sticks at the end should be around 2 m, which is the average distance a player could perform a jumped step. The coach should pay attention how the player execute the jumps and steps while running and to make sure the intensity in kept in the right parameters. There are many variation of the drill, they can jump over the fences in many ways and all the choices are made by the coach, which can adapt this to his daily plan, or weekly plan.